This is the closest off-campus housing available next to Rose-Hulman Institute of Technology. 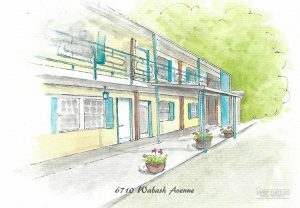 These updated efficiencies, studios, and one bedroom apartments are housed in a mid-century modern adaptive reuse motel! You’ll love having a bathroom and cooking area in your own private space. Our efficiencies and studios can even be furnished for the price which includes utilities. Interested In One Of These Apartments?